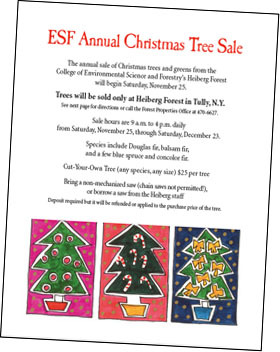 The annual sale of Christmas trees and greens from the ESF's Heiberg Forest will begin Saturday, November 25. Trees will be sold only at Heiberg Forest in Tully,N.Y. Sale hours are 9 a.m. to 4 p.m. daily from Saturday, November 25, through Saturday, December 23. Species include Douglas fir, balsam fir, and a few blue spruce and concolor fircut-your-own tree (any species, any size), $25 per tree. Bring a non-mechanized saw(chain saws not permitted! ), or borrow a saw from the Heiberg staff. Deposit required but it will be refunded or applied to the purchase price of the tree.